Tristar Transportation Co. follows strict guidelines issued by the Ohio Department of Education. We not only follow their driver screening processes, but also adhere to their policies, procedures and reporting requirements. In most cases, Tristar goes beyond what is required of us and our drivers to ensure we are getting the best qualified candidates for our special needs students. Successful completion of the Ohio Department of Education training, our Tristar training and annual in-service classes. Tristar is very proud of our in-house vehicle maintenance department. Our certified Master Mechanics and Technicians maintain a large fleet of late model sedans and wheelchair equipped vans. By centralizing all maintenance and repairs, we maintain the safest fleet on the road. We have handicap accessible vans in our fleet, which can accommodate 1 to 3 wheelchairs, plus 1 to 3 additional passengers. 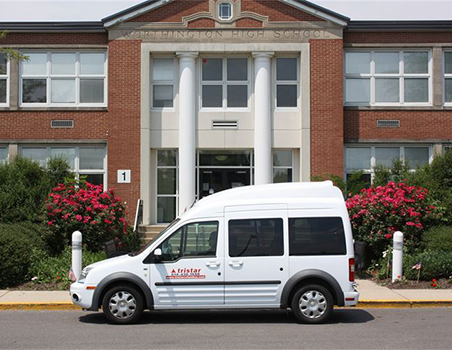 Our handicap vans fully comply with Americans with Disabilities Act (ADA) requirements, Federal Motor Vehicle Safety Standards (FMVSS), and Qualified Vehicle Modifier (QVM) standards. Tristar Transportation Co. invests in safety and efficiency with a robust on-board computer system installed in every Tristar vehicle. Zonar is a state of the art satellite system that is used in many school buses today. The Zonar on board computer tracks vehicle locations using GPS and communicates vehicle and driver performance information captured through the engine’s electronic system. Tristar monitors idle times, vehicle speeds, vehicle locations and other on board events.This up to the minute data helps ensure efficient scheduling, timeliness and increases the safety awareness for all drivers. For more information about Zonar visit, www.zonarsystems.com. Since safety is always at the forefront of everything we do at Tristar, we are in the process of installing video monitoring in all of our cars and vans. This is a common practice today in the transportation industry and one that gives all of us peace of mind. All Tristar drivers carry a push to talk radio/phone. This ensures that the Tristar office can maintain constant communication with our drivers and clients.